Trains were made to do one thing and do it well, HAUL! Live up to this heritage, complete 4,000,000 miles (6,437,376 km) together by 26 April to get an exclusive wallpaper pack. Northern Trans-Pennine is Out Now! Built to work top-link expresses, the BR Class 52 spent its days racing through BR’s Western Region, and it will soon come to life in Train Sim World! A classic dating back to the 1970s, the DB BR 155, is coming soon to Train Sim World for heavy freight-hauling action through the valleys of rural Germany! The DB BR 182, modern and famously melodic, is available now for Train Sim World! As your collections have been growing, one of the common questions coming into us has been about how to share locomotives between routes. Head for the Spessart hills today and take control of challenging services along the scenic Main-Spessart Bahn, which is available now for Train Sim World! On Wednesday 16th January, we were given the opportunity to visit the "Virgin Trains Talent Academy" in Crewe. 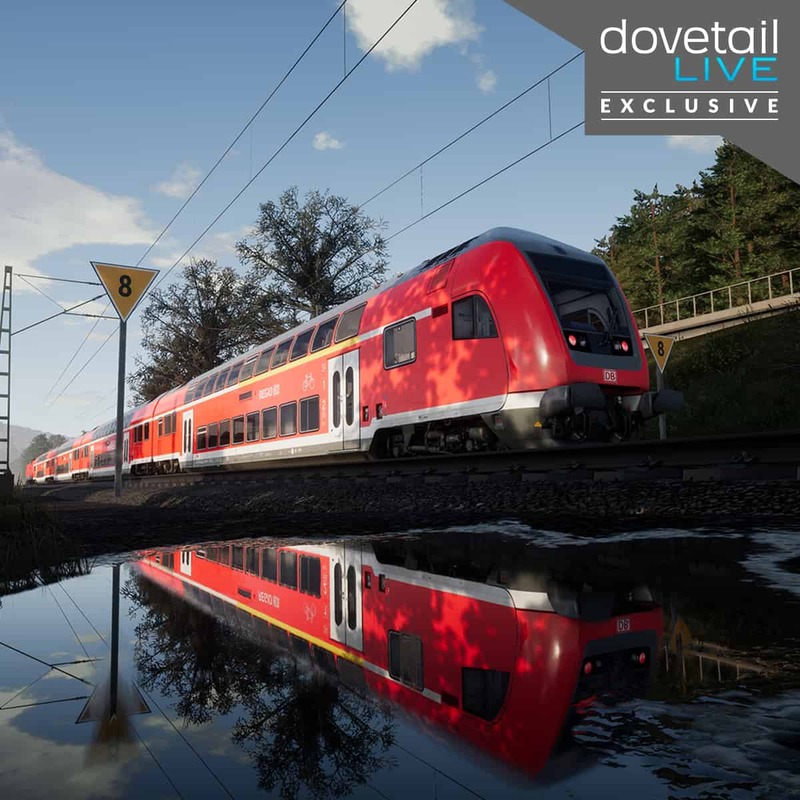 State-of-the-art, stylish, and melodic – three ways to describe the DB BR 182, which is coming soon to Train Sim World for “Rapid Transit” S-Bahn services! Now the festivities are over and we’re well into 2019, Let's see how things have been going and discuss some interesting things we've been working on. Prepare to glisten under the Spessart Sun with Train Sim World: Main-Spessart Bahn, which is coming soon in all its scenic wonder! In response to your important feedback over the holidays, we have today released an update for Train Sim World on PlayStation 4 and Xbox One. Step into the 1980s with Northern Trans-Pennine: Manchester – Leeds, which is available now for Train Sim World on Windows PC, PlayStation 4 and Xbox One. In response to your important feedback over the holidays, we have today released an update for Train Sim World on Windows PC. Return to the scenic West Somerset Railway with the BR Class 33, which is available now for Train Sim World on Windows PC, Xbox One and PlayStation 4! As part of preparing the roll out of the Train Sim World editor for the community, we wanted to start getting some feedback from someone independent. Alongside the release of Northern Trans-Pennine, we have also released an update for Train Sim World: Long Island Rail Road on Windows PC, and is now also released to Xbox One and PlayStation 4. We recently gave some more detail on the Editor and I didn’t want to let another update slip by without giving you some more information. Northern Trans-Pennine: Manchester - Leeds, coming soon to Train Sim World in classic, 1980s “British Rail” fashion! Jamaica is the operational heart and soul of the legendary Long Island Rail Road, and now all its verve and energy comes to Train Sim World! Train Sim World Standard & Digital Deluxe editions are both part of the PS4 Black Friday Sale - you can pick them up now for up to 50% off the normal price!